I’ve spent the week sharing advice, visualization notes and happy-stomach insights for the Marine Corps Marathon. And I want to begin this post by sending my best, speediest vibes to my friends running either the full marathon or the 10K, including Heather from Dietitian on the Run. Now, it’s time to turn my focus toward the race I’ll be running on MCM Day, the Blue Moon Wicked 10K in Virginia Beach. We arrive at the Virginia Beach Convention Center early, leaving the house at 6:30 a.m. to avoid traffic and long lines at the packet pickup. I pick up my bib, lucky No. 814, drop my stuff at the bag check, and entertain myself by watching the costume-contest judging while I wait for the 8 a.m. start. Photo courtesy of the Blue Moon Wicked 10K. I’m in corral one, so I line up at the back of what must be a wide range of pseudo-speedsters (considering that I’m in it, and considering that there were several people in my age group alone running sub-seven-minute miles—eek!). It will be in the low 60s, and with a 30 percent chance of rain, if forecasts hold up—perfectly decent running weather (side note: Kudos to race organizers for posting regular updates from local meteorologists on the race’s Facebook page). 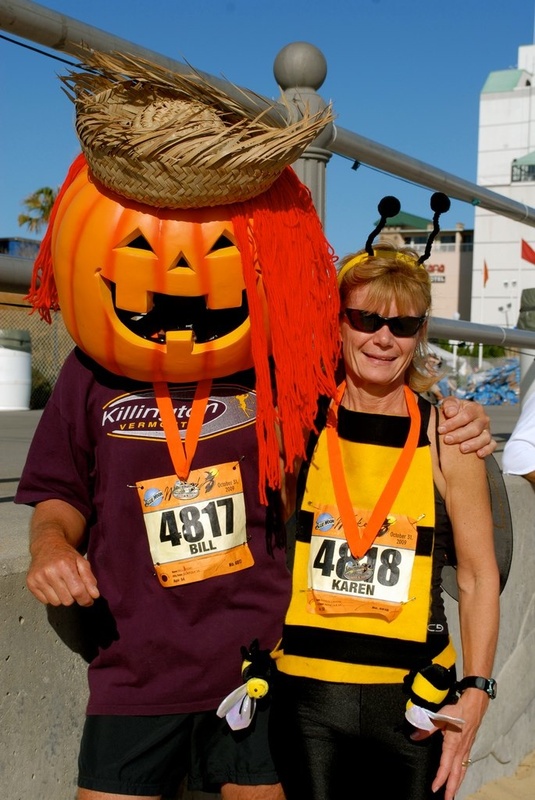 I run slow and controlled for the first mile, from the convention center toward the beach, and focus on enjoying my surroundings—the costumes on my fellow runners, the Halloween candy given out by spectators. I am pleased to see a perfect 10-minute mile on my Garmin when I glance down around the second mile marker. I keep the same steady pace as I begin mile No. 2, which takes me along Atlantic Avenue down to Second Street, where I’ll stop to take in water. The course heads onto the boardwalk, where the challenge will really begin. If I’m feeling good, I pick up the pace a bit here, still running in a controlled fashion that anticipates some extra exhaustion thanks to my recent spate of training-ruining illnesses. I let the first ocean views of the race take my mind off the miles, and remind myself that I’m lucky to be healthy enough to run today, and to be strong enough to know I can finish a 10K even after a considerable training hiatus. I stay steady as the course heads back to Atlantic Avenue, and remind myself to relax and push simultaneously as I start getting sore and tired. I pass the third mile marker, and start looking forward to another water stop at mile 3.5. I find a pleasant sense of flow, though I’m definitely working harder now, and the fourth mile marker comes up sooner than I expect it to. Now, I’m looking forward to the 4.5-mile water stop, which also marks the turnaround point at which we head back onto the boardwalk. I grin widely as I get ready for the fun-filled final mile. Usually, this is a painful mile in my 10K-running life. But today, it is all about enjoying the day, stopping at the “Trick or Treat stop” at 34th Street, nodding at the huge, hulking King Neptune statue, then tucking in and pushing hard for the last half-mile stretch. Will the promise of a medal, a long-sleeve T-shirt and one of these beer glasses motivate me to finish? Yup. I find the energy to give one last kick at the 6-mile mark near 23rd Street, and sprint to the finish at 17th Street. I collect my finishers medal and tumblers (only given to actual finishers—how’s that for motivation to finish?) and hit the post-race party on the beach. I think about how much fun I had, and about how I feel ready to jump back into training for the half-marathon. Have you run the Blue Moon Wicked 10K? Any feedback or advice? Good luck and good weather to you Amy! Yup, I ran this race last year and loved it! It’s just such a fun atmosphere with all the costumes. And the people running it are super friendly and encouraging. A fried egg and ketchup bottle really helped block the wind for me! 🙂 My one piece of advice is try to run in a group of people to gain shelter from the wind. This is by far the windiest race I’ve ever run– definitely challenging. With headwinds and tailwinds, your pace might be off from what your plan is– just go with it!